Kerri and I were discussing risotto and she suggested putting asparagus into it, after which I suggested pairing the asparagus with chorizo. We do have rather a lot of pancetta and lardons in our rather small freezer though, so it made sense to use up one of those instead. We started off in the usual way by softening some finely chopped onion, celery and garlic in olive oil, with the exception that we added the chopped pancetta too. Once this had had a few minutes, in went the rice for a while, stirring so that it didn’t stick, and then some wine and the first ladle of stock. Once the second ladle of stock had gone in, we added quite a lot of chopped sage. Later we added the chopped up asparagus stalks, and right near the end we added the asparagus tips and finally some pepper and a large handful of grated parmesan. The result was really good – rich in flavour and creamy, but with defined texture still left in the rice grains. The stock that we used was home made chicken stock which we had made a while ago and frozen, which made a big difference but sadly that is all used up now. The sage was noticeable but melded into the background nicely. We drank a South African Chardonnay with it, which was rich enough to stand up to the rich stock and parmesan and it also had a toasty note to it which would have really brilliantly with the risotto had we used smoked bacon in it. 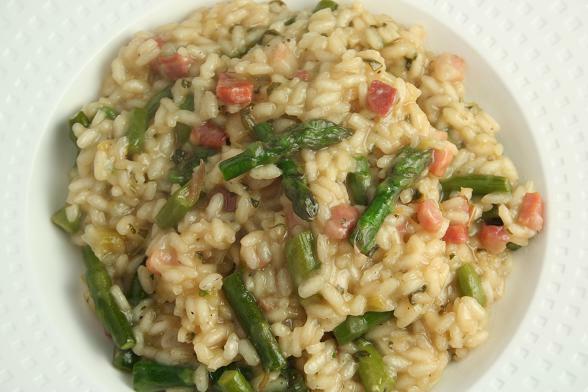 Subscribe to comments with RSS	or TrackBack to 'Asparagus and Pancetta Risotto'. I found your chorizo and squid recipe and then I stumbled along this – good thinking – this looks amazing too…oh dear, spoilt for choice now on what to cook my friend when he comes to dinner! I made this for dinner tonight, it was lovely! Thanks both, it’s such a great combination. I think it’s particularly good because the asparagus season is so short and we don’t eat it often. This looks great and it has my favourite vegetables!